Press the Preview Adaptive 3D Skin button (or hotkey ‘A’) to see how the next Adaptive Skin will look with the current settings. The Mesh Density slider determines the density of the next Adaptive Skin created with the Make Adaptive Skin button. Global Radial Density. 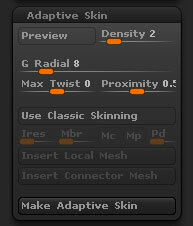 The G Radial slider will control the geometry spanes when an adaptive skin is created. A lower number will create a less dense mesh. Max Twist Tolerance. The Max Twist slider will apply a twist to the selected ZSphere. Proximity Tolerance. The Proximity slider will control the intersecting geometry when there are several ZSpheres into one parent ZSphere. Select the parent ZSphere to adjust the geometry at multiple ZSphere intersection points. Activates Classic Skinning Mode. The Use Classic Skinning button will set the adaptive skin to produce ZSphere skinning of ZBrush 3. This mode is necessary for certain functions such as the Insert Mesh feature used for Mannequins and ZSphere Magnets. Options for Classic Skinning are grayed out when this button is turned off. The Intersection Resolution slider affects the way Adaptive Skins are made. When creating an Adaptive Skin, each ZSphere is either converted to a low- or high-resolution portion of the model. The Intersection Resolution determines how many ‘child’ spheres can sprout from a particular ZSphere before it is converted to a high-resolution portion. Adjust the Intersection Resolution if certain ZSpheres with many ‘child’ spheres don’t convert properly when creating an Adaptive Skin. Finer control over mesh generation can be gained while modeling a ZSphere object, using the X, Y and Z Mesh Resolution sliders in the Transform palette. Membrane Curvature affects the way membranes are created when making an Adaptive Skin. Membranes can be generated at ‘L’ or ‘T’-shaped intersections of ZSphere models. This slider determines the size of the membrane. 0 means no membrane, 100 is the maximum. The Minimal Skin to Child button affects the way adaptive skins are generated at intersections where ZSpheres have multiple ‘child’ limbs connected to them. At such intersections, the first ‘child’ ZSphere in each limb determines the connecting points for the mesh, but does not contribute additional polygons as it would ordinarily. This enables you to generate ‘V’-shaped intersections with clean meshes, and results in more continuous curves. It’s also helpful in skinning multiple poses which might otherwise generate meshes of unequal polygon counts. The Minimal Skin to Parent button affects the way adaptive skins are generated at intersections where ZSpheres have multiple ‘child’ limbs connected to them. At such intersections, the ‘parent’ ZSphere preceding the intersection determines the connecting points for the mesh, but does not contribute additional polygons as it would ordinarily. This results in more continuous curves; it’s also helpful in skinning multiple poses which might otherwise generate meshes of unequal polygon counts. The Pre Divide slider adjusts the density of the lowest resolution for this ZSphere object. If set higher than 1, the density is increased. This slider is active when a Local Mesh or Connector Mesh has been inserted into this ZSphere object. The lowest-resolution density can be adjusted to match the starting resolution of the imported mesh; thereafter both can be subdivided into higher-resolution levels. The Insert Local Mesh button first enables you to select a 3D object from the Tool palette, then inserts it into the active ZSphere (colored red). If Symmetry is active, copies of the object are placed in correspondingly-placed ZSpheres as well. The object’s dimensions are adjusted to fit within the ZSphere’s radius, and the ZSphere is effectively converted to a magnet sphere. The inserted mesh(es) can be moved and resized in the same ways as any other ZSpheres are transformed. The Insert Connector Mesh button first enables you to select a 3D object from the Tool palette, then inserts it into the connection between the active ZSphere (colored red) and its parent. If Symmetry is active, copies of the object are placed in correspondingly-placed ZSphere-links as well. The object is inserted so its Z-axis lies along the connector line between the active ZSphere and its parent. Its ends extend from the center of the ZSphere and the center of its parent. Furthermore, an inserted Connector Mesh can extend across multiple ZSpheres, with evenly-divided segments bending at each position. This is done by moving up the ZSphere chain and Alt-clicking links to convert each successive parent to a magnet sphere. The Make Adaptive Skin button creates a new mesh from a ZSphere object by stretching a ‘skin’ around its surface, and making a number of decisions based on buttons and sliders in this section. Compared to Unified Skins (which can be generated from any 3D object), Adaptive Skins are better for models with fewer polygons, and can create cleaner meshes.